Pocket Pivot. Virtue of Selfish Investing - The home of the Pocket Pivot buy point. This is the original home of the pocket pivot buy point, a buy point observed by Dr. Chris Kacher when the sideways choppy markets of 2004-2005 were making base breakouts fail. But what does not kill you makes you stronger, and the pocket pivot concept was born. 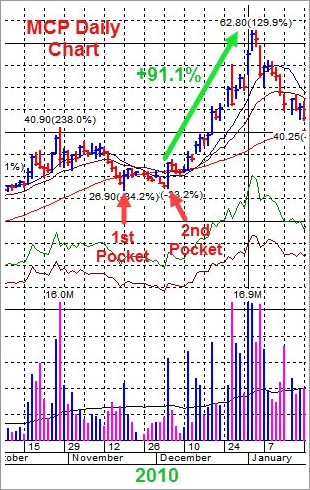 The pocket pivot concept is, in essence, a favorable early-entry buy point in a stock. Buying pocket pivots are to our advantage because they get us into a stock early often before it breaks out of its base. 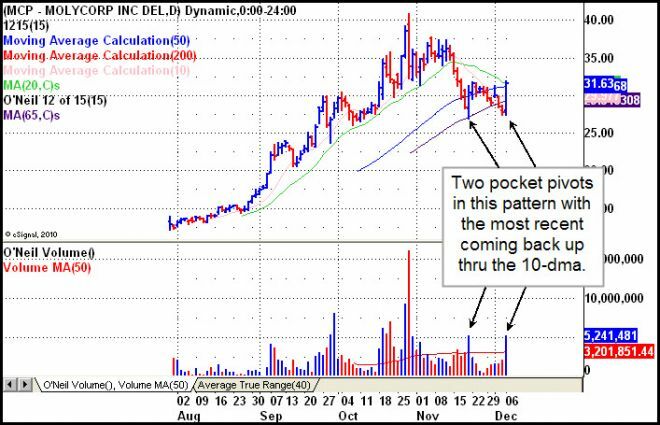 It also enables us to add to a position in a winning stock as such stocks often have multiple pocket pivot points as they move higher. This buying within consolidations and uptrends in most cases leaves price/volume "footprints". The pocket pivot describes that "footprint," and provides a clear, buyable "pivot point," or "pocket pivot buy point." MCP's first pocket pivot occurred after a sharp correction so was premature to buy. But after MCP's base had a chance to round itself out, its second pocket pivot was buyable. That said, today's markets (2013-2017) are far more unforgiving thus we have counseled members to buy on constructive weakness as opposed to strength. Such weakness is represented by a variety of price/volume patterns such as some of the examples we provide in this report: Six Ways to Boost Your Trading Profits. Our weekly Focus List also provides numerous examples. Keyword search "Focus List" in the Reports Archives section of the website.